America has a spending problem, and we are living on borrowed money. Last week, the Treasury Department announced that the U.S. will hit the $16.4 trillion dollar borrowing limit by the end of the year. I truly believe we are facing a real and urgent problem, and I want to walk you through the numbers so you can decide for yourself. It is important to understand the magnitude of our current debt and what it means for the future of America. The numbers below all come from the Department of Treasury’s 2011 Current Financial Report of the United States Government, from the Congressional Budget Office’s 2012 Long-Term Budget Outlook, and from the Annual Report of the Board of Trustees of the Federal Old-Age and Survivors Insurance and Disability Insurance Trust Funds. Another way to look at it is that 87.5% of the annual operating cost of the federal government is borrowed money from foreign governments. Most of the money we are borrowing from foreign governments is from China. Countries like Bahrain, Iran, Iraq, Kuwait, Oman, Qatar, Saudi Arabia, Algeria, and Libya also own treasury bonds. 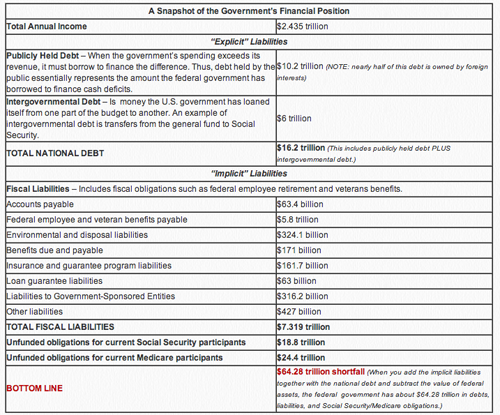 $5.43 trillion in U.S. government debt is owned by foreign interests! The numbers are staggering. In a few years, we will be spending more on just the interest on the national debt than we will spend on our ENTIRE national defense budget. Countries like Greece demonstrate the dangers that result from putting off solving spending and debt challenges. Children born in the U.S. today are saddled with more than $50,000 share of the national debt. If we don’t change course and rein in spending, our children will grow up in the new Greece. Under President Bush the national debt grew by $4.89 trillion in eight years. President Obama has surpassed that amount by nearly $500 billion in less than half that time. Since President Obama took office, the national debt has increased by 51%. It took President Obama just 3½ years to rack up as much debt as the first 42 presidents combined. Under President Obama’s own budget proposal, national debt will continue to rise by more than $9 trillion dollars in the next ten years, reaching $25.3 trillion by 2022. The president and congressional Democrats think we can balance our budget and pay off our debt by raising taxes on the wealthy. Their plan will not work. Confiscating 100% of the individual income over $250,000 would generate $1.36 trillion. Confiscating 100% of the profits of all the Fortune 500 companies would generate $567 billion. All of that corporate and individual income would only fund the federal government for about two months. The only real solution is to cut spending and reduce the size of the federal government. As a staunch fiscal conservative, I have strenuously opposed spending increases regardless of who has occupied the Oval Office. The Ryan Budget (H.Con.Res 34), which would trim $6.2 trillion from the federal debt over ten years as compared with President Obama’s FY12 budget. Cut, Cap and Balance (H.R. 2560), which would immediately trim $111 billion from FY12 discretionary spending and cap future spending just under 20% of GDP by the end of the next ten years. These caps would save $5.8 trillion over ten years. Balanced Budget Amendment (H.J.Res. 1), which would amend the Constitution to require a balanced federal budget. I have consistently voted to reduce the size and scope of the federal government. Rest assured that as your representative, I will continue to work to reduce federal spending so that we can get our great country back on the right fiscal track. I can see the national debt soaring. the day after the re electiction stocks tanked. More bail outs?!? This is scary. Here is the best solution to the federal debt crisis: The National Debt Relief Amendment. www.restoringfreedom.org It will be introduced in Texas during the 2013 session. Please support the effort!